Home » Private or Group Ski School Lessons? Private or Group Ski School Lessons? It’s a long-running debate: is it better to spend your money on private or group ski school lessons? The key question is: while private lessons may cost more, do they offer proportionately better value as you learn faster with one-to-one tuition? Or might you have more fun progressing with a group of your peers, paying less and having a laugh, but perhaps needing more lessons? In fact, it can be worth basing your decision on the particular resort you choose, then looking at the ski school options available to you there. There are a multitude of reasons why people pick a particular resort for their ski holiday, and this is usually all organised before you even start looking into the kinds of ski lessons that are offered. Look at each ski school’s website for any offers and also pay particular attention to their partner page. 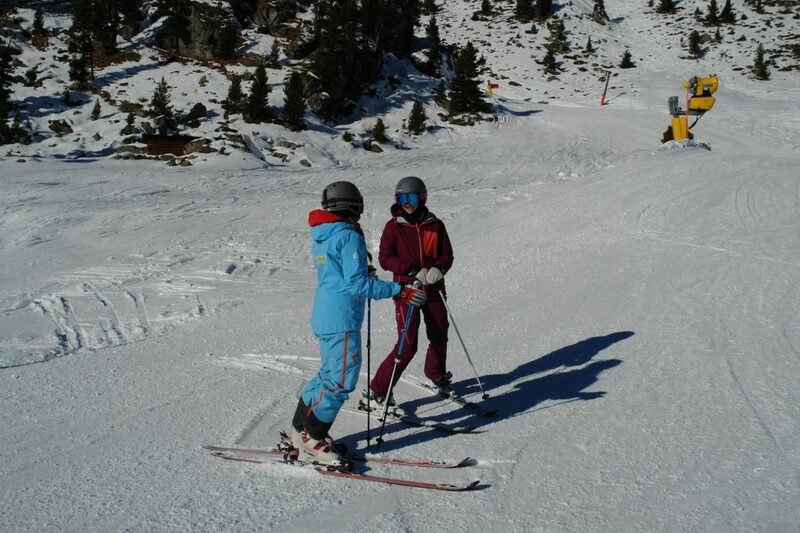 Many rental accommodation sites will offer discounted lessons if booked with a particular ski school. Many ski schools offer a discount on rental equipment when booking ski lessons. As with all things these days, early booking can bring cost savings too. When making your choice, don’t be afraid to discuss your needs and concerns with the ski school prior to booking lessons because they want to help you make the most informed choice possible. The key benefit of a group lesson is that it should promote camaraderie, helping each other to progress as you learn with those of a similar ability and have more fun. It will also be the cheapest option, especially during peak times such as school holidays. Set against this, you have less control over which instructor will lead the lesson, or how many share the lesson (obviously the more people there are, the less one-to-one time you get). Unlike in a private lesson, in a group lesson there is no flexibility on lesson timing, length or meeting point, and you should pay attention to where that meeting point is when booking, as it may require a long walk in ski boots, or even a bus journey! In a private lesson, the instructor can hone in on the individual’s learning style, and progression normally happens at a much quicker rate. You also have much more input in how you want the lesson to progress. You can choose to see a specific view, or visit a particular area as part of the lesson, which can include impromptu coffee stops! Private lessons can be any length: perhaps two hours if you aren’t sure whether or not you will like it. AlpineMojo ski school recently introduced a four-hour lesson, which is perfect for an intermediate to really make improvements. In both group and private lessons, instructors can use private lift queue queues to reduce waiting times during peak season, increasing the time actually spent skiing. All lessons should be fun and enjoyable, but choosing which school or type of lesson can really influence other parts of the holiday, so it is worth researching the options in each resort before booking.